There’s still one more chip to be played by the Cleveland Browns, but for the most part, we know now what the cost was when the Bills moved up to draft Sammy Watkins in the 2014 draft. To recap, Buffalo sent its’ 2014 1st rounder (9th overall) to Cleveland, along with the Bills 2015 1st rounder (19th overall), and a 4th rounder this year. In exchange, the Bills moved up four spots in the first round last year and snagged Sammy Watkins. The Browns used this year’s first rounder obtained from Buffalo to select Offensive Lineman Cameron Erving from FSU. He’s likely to be penciled in as a center for the Browns, probably backing up Alex Mack in his first year in Cleveland. Erving is versatile-he played left tackle at FSU last year. So if you add it up–it’s Cameron Erving this year, troubled CB Justin Gilbert last year, and a fourth rounder still to come. That’s what the cost was for the Bills to move up and pick Sammy Watkins. With 65 catches and six touchdowns in his rookie year, and the promise of much more to come, it’s hard to imagine one of the players the Browns picked having nearly as much impact as Watkins. 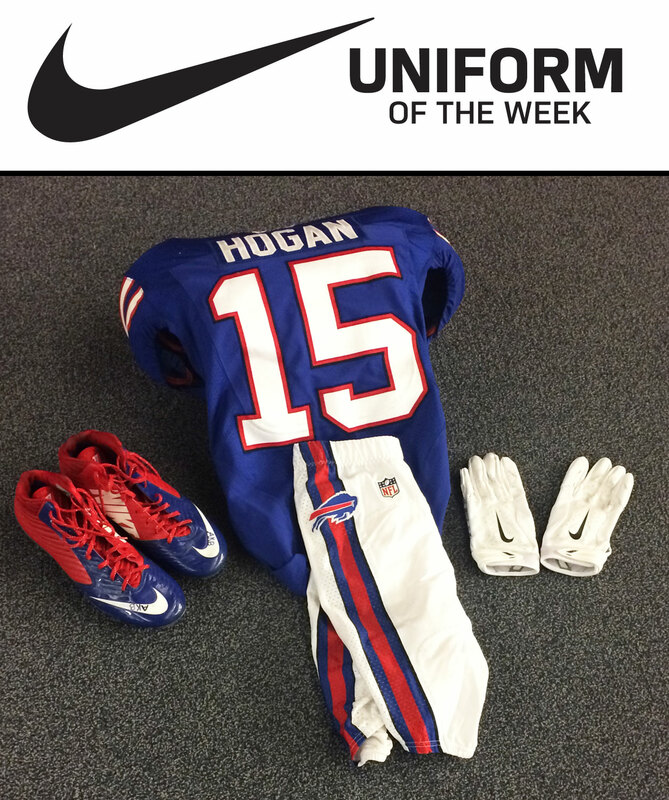 Each week Nike presents the Uniform of the Week where you’ll see a photo of the combination your Buffalo Bills will be wearing on the field. Here’s a rundown of gameday activities for Sunday’s week 12 game against the Cleveland Browns. Gameday Experience: ADPRO Sports Training Center open 9:30 a.m. The first 50,000 fans through the gates will receive a Unyts Panini football trading card pack. Play 60 Recognition: 12:50 p.m.
*The Radiant Heaters will be turned on in the sideline clubs. To celebrate the NFL’s Play 60 movement to encourage kids to be physically active for 60 minutes each day, the Bills will host 20 local children – 10 participants from the Independent Health Foundation’s Fitness for Kids Challenge and Play 60 Challenge and 10 from the American Dairy Association and Dairy Council’s Fuel Up to Play 60 program – to form Stampede Row as Bills players take the field. In response to a critical need for blood following the recent storm, Unyts will host a blood drive in Ralph Wilson Stadium’s Paul Maguire Club on Tuesday, December 2 from 11 a.m. to 8 p.m. All presenting donors will get an exclusive, behind-the-scenes tour of the newly renovated gameday locker room and the first 300 presenting donors will receive a One Buffalo t-shirt. For more details, visit www.unyts.org, click “Give Blood,” and use sponsor code 1925. Tailgating Reminder: No open fires are permitted in the Bills parking lots or on stadium grounds. Fires in contained grills are permitted. Please do not empty hot coals on the parking lot pavement. Thank you! Security Process: Remember to arrive at the gates early to avoid missing any of the pregame activities. Be sure to empty pockets in preparation for the metal detection screening process at gate entry. Make Mom Proud: Follow the Bills fan code of conduct available here. Designated Driver: If you’re over 21, stop by any Guest Service Booth and pledge not to drink and make sure everyone in your group gets home safely. Designated drives will receive a coupon good for one non-alcoholic beverage and will be entered into a raffle to win the Designated Driver of the Game prize and sweepstakes with a chance to win Pro Bowl or Super Bowl tickets. Sign up here. The Buffalo Bills are teaming up with Pointstreak 5050 on an innovative platform to raise charitable funds for the Buffalo community and Western New York region through an electronic 50/50 raffle on gamedays at Ralph Wilson Stadium. The Pointstreak 5050 system enables raffle tickets to be sold to fans through mobile sellers utilizing electronic handheld devices, portable printers, and a number of stationary selling terminals around Ralph Wilson Stadium with half the proceeds going to one lucky fan and the other half going to the United Way of Buffalo & Erie County. Clear Bags smaller than 12” x 6” x 12” are permitted. One gallon clear plastic freezer bags are permitted. Small clutch bag approximately the size of a hand, with or without a handle or strap is permitted. The Bills lost their defensive coordinator Mike Pettine Thursday as he becomes the head coach of the Cleveland Browns. But he’ll be coaching back in Orchard Park in 2014. That’s because the Bills will play host to the Browns next season. When Buffalo faces Cleveland will be known in mid-April when the NFL releases their 2014 regular season schedule. His plane from Mobile that was connecting through Atlanta en route to Cleveland today was delayed, but the local television station in Cleveland is reporting that Mike Pettine’s plane has landed. ESPN has reported that the Browns will formally offer him the Browns head coaching job and proceed to negotiate contract terms to finalize and consummate the partnership. ESPN NFL reporter Adam Schefter just appeared on ESPN radio in Cleveland to provide further clarity to his tweet a bit earlier this morning that the Browns are prepared to offer their head coaching job to Bills defensive coordinator Mike Pettine. Here’s what he said in a brief interview just a few minutes ago late Thursday morning. Schefter left the door open a crack that if negotiations don’t go well things could change, but he believes all parties involved want Pettine as head coach to be the end result. “They will have to get the deal done with Pettine, but they’re expected to offer him the job, he wants the job, they want him to take the job, so unless something happens that’s where it’s headed right now unquestionably,” Schefter said. The waiting game may finally be over. ESPN NFL reporter Adam Schefter is reporting that the Browns are going to offer their vacant head coaching job to Bills defensive coordinator Mike Pettine. So it sounds like as long as the two sides can agree on the contract terms Pettine will become the next head coach of the Cleveland Browns. Bills defensive coordinator Mike Pettine should learn his ultimate fate concerning the Browns vacant head coaching position for which he is now being labeled a front runner in some media reports. He and one other unnamed finalist for the job will interview one final time in Cleveland with the Browns brass Thursday. There are conflicting reports as to whom Pettine is in direct competition with. NFL.com’s Ian Rapaport reported that it was Seattle DC Dan Quinn who was the other finalist, but other reports disputed that. However, those other reports could not concretely say who the other finalist was. Either way it appears that the chances of the Bills losing Pettine to the Browns is at worst a 50-50 proposition. ESPN NFL reporter Adam Schefter made an appearance on the Michael Kay Show in New York on ESPN radio and he was asked about where things stood with the Cleveland Browns head coaching job and whether Bills defensive coordinator Mike Pettine would be named to the post. He categorized Pettine as a “fall back” option. Here were his full comments on the Browns job and Pettine. “I’ll say this on the Cleveland Browns. Expect the unexpected,” said Schefter late Wednesday afternoon. “The Mike Pettine situation is going on, they’ve interviewed him twice. If they wanted to hire him they could just go ahead and do that and maybe they still will. “But me reading between the lines, they’re hopping around, they’re interviewing other candidates, they’re bouncing around the country. I think if Pettine were their guy it would just be over and done with. And the longer it goes on the less likely in my mind that Pettine becomes the guy. “I think he’s in play clearly. I think I would categorize him now as a fall back option. I think they’re looking at other things. They’re interviewing other candidates. They spoke to Dirk Koetter this morning. They’re continuing to reach out to people. Bills defensive coordinator Mike Pettine is still down at the Senior Bowl after interviewing with the Browns a second time last night. Naturally he’s being asked for comment on how things went with Cleveland Tuesday evening, but he’s chosen not to comment until he hears back from the Browns, which he reportedly expects in short order. A Browns reporter has tweeted that in asking for Pettine to comment, the Bills defensive coordinator declined, but did say he expects to hear back from the Cleveland franchise by the end of today (Wednesday). Atlanta offensive coordinator Dirk Koetter who was reportedly to be interviewed by Cleveland must presumably happen today if the Browns are to make a final decision. Bills defensive coordinator Mike Pettine had his second interview with the Cleveland Browns Tuesday night in Mobile, but reports indicate the club will interview other candidates and have not offered the job to the sharp defensive play caller. That according to a Cleveland.com report. Reports have indicated that the Browns will interview Atlanta offensive coordinator Dirk Koetter and plan to interview Seattle defensive coordinator Dan Quinn a second time. So at this point the Bills and Pettine are again in a holding pattern. Bills GM Doug Whaley admits it puts them in a tough spot. Other candidates for the Browns head coaching job are beginning to surface. FOX Sports Alex Marvez has lobbed another name into the candidate pool. According to Marvez, Atlanta offensive coordinator Dirk Koetter is going to meet with the Browns about their vacant head coaching position. For those Bills fans worried about the potential departure of Mike Pettine, who is a candidate for the job this is a good development. Having seen Denver OC Adam Gase pull his name from the list of candidates today (Tuesday) and then see an offensive coordinator added to the pool is an indication that Cleveland is still eager to find an offensive mind knowing that side of the ball needs more fixing for their club. We’ve heard for almost a week that Bills defensive coordinator Mike Pettine had earned a second interview with the Cleveland Browns for their vacant head coaching post. Now we know when it will take place. ESPN’s Adam Schefter is reporting that Pettine will have his second interview with the Browns tonight (Tuesday). Browns second meeting with Bills DC Mike Pettine is scheduled for this evening. The Cleveland Browns coaching search was seemingly narrowed Tuesday with the report that Denver offensive coordinator Adam Gase had pulled his hat out of the ring. Now there is a report that Cleveland will be interviewing other candidates. That according to ESPN NFL reporter Adam Schefter, who tweeted as much. This report also indicates that the Browns were keeping their interview schedule open in the hopes of meeting with Gase and now that he’s declined they’ll move ahead with interview number two for Bills DC Mike Pettine and pursue a second interview with Seattle DC Dan Quinn. Bills DT Marcell Dareus, who is headed to Hawaii for his first Pro Bowl, made an appearance on the John Murphy show Monday evening. After talking about his first NFL all-star game appearance he was asked about the possibility of losing Mike Pettine as his defensive coordinator knowing he’s in the running for the Cleveland Browns head coaching post. With Denver offensive coordinator Adam Gase now reportedly removing his name as a candidate for the Browns job, Pettine’s odds of becoming a head coach in the NFL have improved. Dareus liked the way Pettine gave him freedom in his role at defensive tackle this past season. 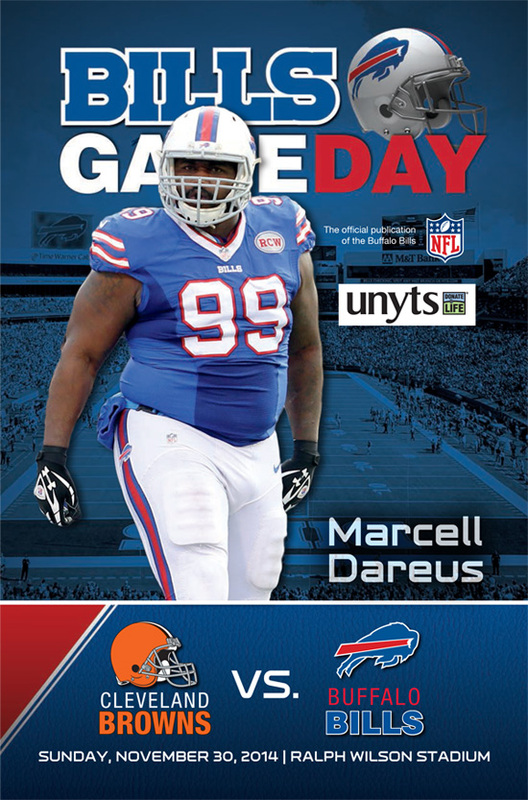 Dareus finished with a career-high 7.5 sacks in 2013. According to the Denver Post beat reporter for the Broncos, Mike Klis, Denver offensive coordinator Adam Gase has withdrawn his name as a candidate for the Cleveland Browns head coaching vacancy. Klis reported the following this morning. Broncos offensive coordinator Adam Gase called Browns today to say he is withdrawing as HC candidate to concentrate on Super Bowl. Gase was considered one of the front runners for the job by the Cleveland media even though he had yet to interview with the club. There were rumors over the weekend that Gase might remove his name from contention. The other reported favorite was Seattle DC Dan Quinn, but with him also preparing for the Super Bowl they would have to wait to hire him as well. Whittling down the candidate pool certainly doesn’t help Buffalo’s odds of holding onto defensive coordinator Mike Pettine, who is reported to have a second interview lined up with the Browns. Bills defensive coordinator Mike Pettine is in the hunt for the vacant Cleveland Browns head coaching post. Reports indicate he’ll get a second interview with the AFC North club. But where do Browns fans stand when it comes to their preferences of the candidates that have been mentioned for the job? Cleveland.com conducted a poll online asking Browns fans which coaching candidate they preferred for their next head coach. Here were the results as of 9:40 am Tuesday. Which candidate is your favorite for the Browns? The Seattle Seahawks defensive coordinator is the clear front runner by more than a 2:1 margin over the next highest vote getter among fans. It’d be hard to blame them in light of what he’s done with his NFC champion defense. Beyond that however, it’s clear that Browns fans have other preferences as ‘Other’ came in second with almost 21 percent of the vote. The only drawback for the Browns with Quinn is they’ll now have to wait to hire him until after the Super Bowl if he’s their top candidate. Bills defensive coordinator Mike Pettine remains in contention for the vacant Cleveland Browns head coaching vacancy after interviewing with the AFC North club last week. There are reports he will interview a second time with Cleveland. Bills head coach Doug Marrone commented on how the situation may impact his team if things work out for Pettine in Cleveland. While the reports were out there that the Cleveland Browns were to have a second interview with Bills defensive coordinator Mike Pettine for their vacant head coaching job, that second interview has yet to take place. According to NFL.com’s Ian Rapaport Pettine will be called back for his second interview. Rapaport did not have a timetable as to when it will take place, but it will presumably take place this week. The NFL reporter also made it clear that the Browns still have strong interest in Denver’s offensive coordinator and Seattle’s defensive coordinator. With the news breaking Wednesday night that Bills defensive coordinator Mike Pettine will interview Thursday for the vacant head coaching job of the Cleveland Browns, here’s a look at the other names around the league that have been linked to the Browns head coaching post. While some might see the Cleveland job as an unattractive one with a seemingly misguided course for the future (see: Richardson trade, Chudzinski firing combo), the fact remains that they have a top 10 defense with a good deal of talent. The offense is what needs fixing including a search for a better quarterback answer. But as Browns owner Jimmy Haslam pointed out in his letter to Cleveland fans, their club has more salary-cap room than all but one NFL team. They also have three of the top 35 picks in the upcoming draft and five of the top 83 selections. Adam Gase – Denver Broncos offensive coordinator – Reported to be the front runner for Browns job, but has not yet interviewed with Broncos still in playoffs. Mike Munchak – Former Tennessee Titans head coach – Interviewed, reported to be a fallback option. Dan Quinn – Seattle Seahawks defensive coordinator – Interviewed, still coaching in playoffs. Reported to be a fallback option. Mike Pettine – Buffalo Bills defensive coordinator – Scheduled to interview Thursday. Bob Stoops – Oklahoma Sooners head coach – Only reported by media to be a candidate. Todd Bowles – Arizona Cardinals defensive coordinator – Removed himself from consideration for job. Ben McAdoo – Green Bay Packers QBs coach – Hired as Giants offensive coordinator. Josh McDaniels – New England Patriots offensive coordinator – Removed himself from consideration for job. Ken Whisenhunt – San Diego offensive coordinator – Accepted Tennessee Titans head coaching post.